Home / Sports / "Golden Shoe": First Salah, second Messi ... Ronaldo! "Golden Shoe": First Salah, second Messi ... Ronaldo! The race for the "Golden Boot" continues to be hot. Salah has passed Messi ... Egyptian counts 30 goals, Leo 29 ​​- did not score in midweek against Celta Vigo. The race for "Golden Boot" is becoming more and more interesting this edition. 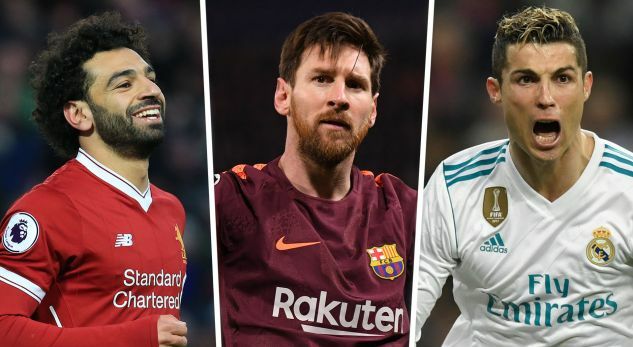 Mohammed Salah continues to be the first with 30 goals, one more than Lionel Messi, who entered as a substitute in the 2-2 draw with Celta Vigon, without scoring. The third ranked Ciro Immobile with 27 goals, sharing that position with Bayern Munich striker Robert Leandrovanki, who also scored 27. Top 5 is completed by Harry Kane, which counts 26 goals. Jonas with 33 goals scored more than everyone else, but in Portugal a goal is scored 1.5 points, unlike the top five European leagues, where a goal is scored 2 points, so he ranks seventh. This lap Cristiano Ronaldo was invited by Zinedine Zidane and saved Real from losing with Athletic Bilbao to "Santiago Bernabeu", ending 1-1. The Portuguese went on to quote 24 goals in La Liga, he ranks 9th in terms of the "Golden Boot".